Sunrise Leather Works at the Grand Village Shops is where you can enjoy great shopping in Branson if you are looking for classic hand crafted leather goods that are really made from scratch. In this leather shop, you can see many beautiful works of art for yourself. During the time when American craftsmen made things from scratch, hand crafted items were very much appreciated. But even in today’s hi-tech age where iPhones and internet seem to have taken over, we still have an undying interest and desire to own leather goods. In this internet age, there are still people who believe in the art of leatherwork, one of those is Greg, the owner of Sunrise Leather Works. Greg has been crafting leather for more than 40 years. Having started his business at the age of 16, it has now grown into a thriving leather shop full of handmade leather crafts and leather goods like belts, phone cases, money clips, hats, wallets, purses, etc. Shopping in Branson can be enjoyed best at the Grand Village Shops as you can find here nearly 2 dozen unique and cozy shops in a Victorian village setting. In this shopping destination, there is something for everyone - you will find fashion wears at Grand Glitz, books at TJ Charleston’s, unique items at Lori’s Soap Market, food and decor at Mulberry Mill, and of course leather goods at Sunrise Leather Works. You can also find craft items including hand blown art at Helwig Art Glass, modern works of art at Peter Engler Woodcarving & Design and the Signature Art Gallery of the late Thomas Kindade. This great shopping village will take you on a leisurely walk along cobblestone streets that lead to an unforgettable shopping in Branson. An array of specialty shops provides a unique mix of arts and crafts, boutiques, entertainment, and fine restaurants that you won’t find anywhere else in Branson. If you want to discover the talents of Branson’s best craftsmen and artisans, just follow charming paths until you see them demonstrating their skills right in front of you. After appreciating on their great works, stop for delicious meals and treats, and indulge yourself and your loved one with unique gifts. Whatever your taste, your experience at Grand Village Shops in Branson will be a unique shopping trip to remember. The stylish shops and fine restaurants and beautiful pathways complete with fountains, greenery, and stylish architectural design make Grand Village Shops a wonderful place to visit. Here you can find unique artwork, souvenir items, gift items, clothing, and entertainment all in one place. You can also have the chance to enjoy with the indoor miniature golf course which provides an exciting afternoon activity for all visitors. 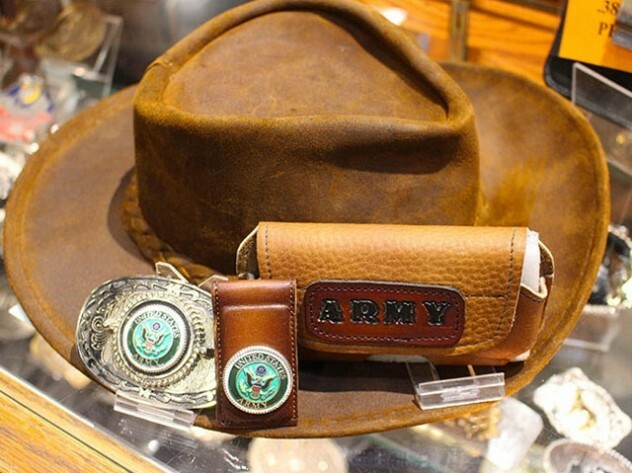 So, if you are looking for a shop in Branson that offers a wide selection of classic handcrafted leather goods that are really made from scratch, Sunrise Leather Works at the Grand Village Shops is the shop that you should visit.